This description of Hamse Warfa's work was prepared when Hamse Warfa was elected to the Ashoka Fellowship in 2017. From a paradigm of (alleged) transience, dependency and lack of autonomy, Hamse Warfa is using the growing success of a radically new financial services “app” to help key gatekeepers in the refugee space pivot to a paradigm where the refugee experience is understood to be marked by permanence, independence, interconnection, and agency; things that all people need to thrive but that have been systematically denied to refugees in our current “dependency” paradigm. Hamse’s key lever in driving this paradigm shift is BanQu, a blockchain-­‐based system that anyone with a connected device can access to more accurately describe, capture, and validate their full economic activity, thus creating a more complete economic identity. For migrants, refugees, and stateless people around the world, this is game-­‐changing. On this platform they own, secure, and manage their data and connect to a global trusted-­‐ network of real people in their lives plus institutions and opportunities that can better it. Current financial tools don’t work for refugees and old-­‐paradigm intermediaries have reduced individuals to static ID numbers. But Hamse’s understanding of refugees’ realities plus his BanQu team’s ability to harness the potential of the blockchain and financial inclusion innovations are providing the required leverage to disrupt the global refugee “industry”. By the end of 2017, thousands of refugees will have directly benefited from building and owning their economic identities, but the real systemic changes will ripple out across the UNHCR, refugee-­‐serving NGOs, financial institutions, refugee diasporas, and even the public’s conception of what it means to be a refugee. In a world where we will likely see more refugees than fewer in the future, it will be that much more critical that all actors are aligned with the reality of refugees as full economic citizens (empowered by models like BanQu) and working in the new paradigm. The average stay in a refugee camp is 17 years, a period during which stateless people are subject to the near-­‐ absolute power of the administering agencies that are charged with their care. With little expected of the individual refugees and seemingly little oversight of the refugee-­‐serving agencies, globally what we’ve built is a complicated, expensive system rife with inefficiencies, that dehumanizes the very people it seeks to support, and where the more informal systems that have popped up (like financial transfer services for individual refugees to access diaspora capital) are marred by exorbitant costs. But why “from scratch”? What if we could build a more complete picture of a person’s financial, educational, and even social transactions that they could carry with them? Something more analogous to the full profile of assets and attributes you’d attach to a person you truly know. This is the question that kept coming back to Hamse as he pondered the squandered years refugees spend in limbo, when the global institutions that seek to support them could be better helping them thrive. To Hamse, a key part of the answer seemed to be in building a verifiable, immutable, transaction-based identity and helping create the conditions for folks to trust refugees. Globally, it is estimated that some 2.5 billion people cannot prove their identity, with the most acute cases being that of refugees and displaced people, where the transactions that can help you build a full, financial identity are scattered. Mobility is increasing and the lack of a system for verifying global, immutable transaction-based identities is a bigger problem now than ever before. By developing a financial inclusion platform that exposes flaws in the design of the migrant population and remittance systems, Hamse and his co-founders can also shine a light on the flawed design of the global economic ecosystem that leads to extreme poverty, and the flaw in the design of the supply chain of products and services that contribute to the failed promise of emerging markets. Hamse is challenging top-­‐down approaches to working with refugees by creating an ecosystem that is based on identity, trust, and community. Hamse’s solution arises from a constellation of factors, namely the global penetration of smart phones (even in refugee camps), the emergence of the blockchain’s distributed ledger technology (where his co-founder Ashish Gadnis is considered a ‘guru’), and the refugee “sector’s” outdated worldview. To help refugee-­‐serving agencies shift from thinking about immediate needs and towards building foundational assets, connections, and an economic identity, Hamse and his co-­‐founders at BanQu are building a global platform and trusted-­‐network that empowers everyone on it with a verifiable, immutable identity that they control. Based on the blockchain (the “distributed ledger” technology that allows for recent global, democratic innovations ) anyone with a connected device – and with the help of BanQu’s software and applications -­‐ can build an encrypted and authentic transaction identity. Conceived of in 2014 and officially launched in late 2016, the BanQu platform enables refugees to record, secure, and document their full “baseline information” including demographic details, property and assets, credit and transactional history, health records, education records, and even energy consumption. Not only do individuals manage and control their own identities (as opposed having their data owned in a centralized, corporate-­‐controlled database) but they exist in an enabled ‘trust-­‐network’ since family and trusted relationships, diaspora relationships, and links to INGOs, government agencies, and other institutions are also captured. Through BanQu, refugees then have access to financial services, can better understand their spending behavior, and monitor their savings. Getting started is relatively simple. A new user creates a profile, and each time a new piece of information is to be added it is time-­‐stamped, authenticated by a third party who also has a verified identity, and is stored in encrypted bits across the blockchain’s “distributed ledger”. In this way, refugees (and the poor in general) can leverage the capturing of these meaningful life events and relationships to thrive in local and global economies. In the pre-­‐BanQu model, an individual trying to prove that she was the recipient of a Certificate of Completion of a course in, say, computer science at Kenyatta University would hold onto her printed certificate, and if anyone were to challenge her claim they’d have to decide if the certificate (based on its seal, or its signature, or the weight of the paper) was authentic, or perhaps find a way to call Kenyatta University and see if they have corresponding records of this woman’s attendance. In the model facilitated by BanQu, paper certificates are a thing of the past and certificates and diplomas from Kenyatta (or any other institution of higher education) would be attached to a graduate’s digital identity by a verified representative of the university and authenticated by the graduate herself. Refugees with paper certificates from any institution can still have them verified by independent third parties (like local staff at international non-­‐governmental organizations) and stored far more safely as part of an individual’s digital profile. Similiarly, BanQu also offers registration, certification and validation for refugees' work history. This is more than a digital, verifiable CV; BanQu also enables users to control their network and select who they interact with, the level of interaction, and what pieces of information they choose to authenticate and add to their profiles. These robust profiles then become actionable because the BanQu platform integrates seamlessly into existing payment gateways and allows refugees to connect with markets, sell goods and services, receive payments through a third-party payment gateway, and build a transaction history along the way. BanQu already has several financial, supply chain and NGO institutions among its partners, and as more come online more BanQu users will be able to directly link with banks and other more traditional financial service providers, not just in the camps but in the communities into which the refugees resettle. The North American or European individual who’s never had his resume challenged or his academic credentials questioned (much less engaged in international cash transfers) may not be able to fully relate to the trust-­‐gap that exists between refugees and the individuals and institutions they encounter on their paths to permanence. Americans and Europeans live in the world of networked financial institutions, FICO scores, and credit rating agencies, which are missing in the developing world where it remains hard to verify who you are much less your trustworthiness to others beyond your friends and neighbors. But while refugee-­‐serving organizations invest huge amounts of time and other resources into attaching static identity markers or “IDs” to refugees, they do this not to address this systemic lack of trust but because of it, giving in to their instincts to question, monitor, and control. These desires, well-­‐intentioned though paternalistic, provided the opening for BanQu to help aid organizations meet their data and tracking needs. They pay for the service and gain greater transparency over what their own work, but the refugees served benefit at the individual level by owning and managing their more complete identities and transaction history. BanQu has already partnered with leading organizations and agencies working with refugees globally and are doing pilots in East Africa, Jordan (Syrian refugees) and Lebanon. The Rockefeller Foundation invested a grant of $350,000 to BanQu to develop its software. BanQu also won the MIT innovation award for refugee solutions. BanQu’s platform is free for refugees. It generates its revenue from its subscription model to development organizations, banks and multinational companies interested in KYC (know your customer) and last mile visibility of its customers. In exchange for far better data on where their goods and services end up and with whom they are working, the fees these organizations pay cover the costs of developing the software and supporting the BanQu operations. Hamse and BanQu’s theory of change is that empowerment through the establishment of an economic identity changes the power imbalance refugees experience in camps, forces the refugee-­‐serving agencies to be more collaborative and efficient, and leads to greater financial inclusion, contributing to overall GDP growth and improving efficiencies in leveraging global diaspora and philanthropy capital. At the individual level, is particularly game-­‐changing for individual refugees who have the opportunity to be resettled. The difference between landing in your new home with an ID number versus your full, verifiable economic identity is night and day. Today new arrivals lack of a single source of data with details about their history work, education, aid assistance, or participation in any other resettlement programs. They are dropped, essentially anonymously, into the current 90-­‐180 day resettlement program, but since the initial “home allowance” stipend is not connected to a bank account (for the most part) it isn’t optimal in helping refugees begin to establish their economic identity, much less access something as essential as a car loan. But this is already changing. Less than a year in, BanQu already has several thousand users and is on track to finishing 2017 with at least 15,000 individuals are adding more international non-­‐governmental organization partners and financial institutions. (They currently have three development organizations as partners, two financial institutions, a micro-­‐insurance provider, and one multinational corporation - with a second multinational corporation contract soon to be closed.) Going forward, however, the impact won’t be measured in individuals or institutions connected, but the relationships between them as diaspora capital flows are linked to banks, as service-­‐providers in camps begin to differentiate and diversify their programmatic offerings, or even as education programming for refugees starts to more directly link with prospective jobs at global employers. In this way – by ushering in an ecosystem that is based on identity, trust and community (versus more directly confronting or challenging the top-­‐down approaches of the refugee-­‐serving sector), the “playing field” for refugees is becoming more level, the rules of the game fairer and easier to follow, and – the best part is – everyone wins. Hamse’s insights and passion are informed by his own experience as a refugee, and his success to date is fueled by the impressive professional experience and network he’s built in Minnesota and globally, from having served as a Senior Program Officer at Margaret A. Cargill Foundation (the 7th largest foundation in the world) where he managed the foundation’s global and domestic child & families and health investments, to his prior work in development finance, his turn as an author, and as a key driver of various local social change initiatives in Minnesota (where he’s found opportunities to directly collaborate with nearly half of the local Ashoka Fellows). 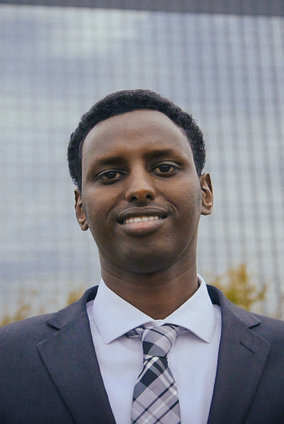 One such cross-collaboration is the coalition he founded and convenes, The Somali Coalition, which seeks to improve the lives of Somali Americans in Minnesota's globalized traditions and cultures. The Coalition leverages the collective influence of community and philanthropic leaders in order to increase awareness, understanding and appreciation of the Somali community, improve the quality of life for Somali Americans, and achieve funding efficiency that meets the greatest needs - and builds on the strengths - of Somali community. After the 2016 U.S. presidential election outcomes, Hamse and his colleagues launched Sambusa Sundays, an effort to build bridges between his immigrant Somali/Muslim community and their neighbors, and hits at the many layers of work needed to help more recently-­‐arrived Americans thrive.